I pinned this specific dress, and I absolutely love it! It may be my favorite summer staple that is currently hanging in my closet. It's so soft, a perfect length (I'm 5'9), and has easy nursing access. The back is a "V" as well, which makes this dress stunning. I loved the colors of this top and even liked the abstract pattern it had going on. But it was far too short for me, and it felt a bit restrictive. Not necessarily tight, but the fabric didn't give at all. I sent this back. I loved this color on me! And I liked the different hem line, even thought it made it feel a bit short. One of the main reasons I didn't keep this top, is that I wanted a summer fix. 3/4 length sleeves absolutely will not work in summer in hot Salt Lake City! Sent back. 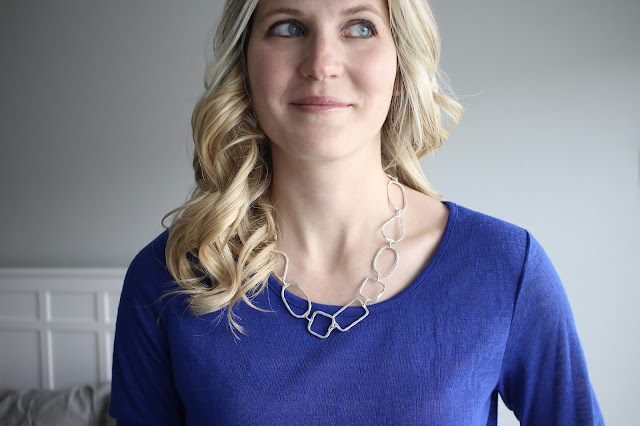 Zad Denmark Hammered Abstract Shapes Necklace The necklace was not my style at all. I tend to wear really simply jewelry right now. Because my kids are always grabbing it, or snagging it. And with baby wearing, I just can't have something bulky right by Finn's face. Plus, I felt like the necklace was poorly made, which is how I feel about a lot of Stitch Fix jewelry. Sent back. I pinned these jeans, and I so so wanted to keep them! They fit like a glove and paired perfectly with a ridiculous amount of tops! But the realistic side of me kicked in... I cannot wear white jeans around my young boys. I'm constantly picking them up, and their dirty shoes would be all over my pants. All. The. Time. So sadly, I decided that white jeans will just have to wait a few years. Sent back. Overall, I was pretty pumped about this fix. I try to only keep one item per fix, so the dress was an easy choice. If you are one of the crazies that has still yet to try Stitch Fix, do it! I think summer is the perfect time, since they have a ridiculous amount of gorgeous dresses right now!!! And if you try it because of me, I get a nice little kick back; so of course, I appreciate it! Now tell me... did I make the right choice?! I think that everything looked fantastic, but I totally understand not keeping certain things due to practicality. The dress will be great for summer! It looks very light and comfortable. P.s. If those jeans come in a more kid-friendly colour, you should ask for them in your next fix... they look AMAZING on you! Everything looked amazing on you. I would have made the same choices. The jeans looked so great on you, but I totally agree with them getting dirty and not being kid-friendly. Bummer! Those jeans look amazing on you! Hot mama! I agree you should request in a different color. I would love white jeans too! Maybe in a few years lol! That dress is so pretty! I love it! I don't think I could ever pull off white jeans for practicality purposes either, but I always think they look really good on other people. Damn girl! You look AMAZING in those white jeans, but I could totally see why you would send them back. I would do the same. Unfortunately white jeans are just not practical with kids, especially boys! That dress is AMAZING also! LOVE LOVE LOVE. So glad you kept that! I recently got a dress too that I LOVE and it's finally long enough for me too! I did like that uneven hemmed shirt, but I agree, it might have been a little short. Total bummer that it was out of season and short because it's super cute!! Love the first dress, lady! You look fabulous. I am one of those crazies!! I need to try it already! Loving that dress you are keeping, the print is gorgeous! You look great in each style. I love that dress. It's gorgeous. I'm hoping to find a few more dresses for the summer that are comfortable and I can move around in! Love, love, love that dress! You look fantastic in it! I really like all the things you got! But totally agree with why you sent each back, minus the dress. I'm pretty sure I'd be setting myself up for failure if I wore white. Even without kids, I'm just not that lucky. I'd sit in the chocolate every time. Love all of the items in this fix. I definitely get you sent many of the items back though. Unfortunately it is so difficult to find nursing friendly tops and white pants just won't do with little boys. I'm very quickly learning that!! That dress looks stunning! (so do the white pants......but yes..in a few years). I really like the pattern in that first top - too bad it wasn't longer and more comfortable! That dress is awesome though. Love seeing your fixes! And amen to no white pants. Sad face! looks like you got some great stuff!! I love white pants too, but like you, with two small children, I'd be certain to have blueberry finger prints and face-wipe all over them!! Beautiful Fix! I love the Maxi dress on you!! I completely understand about the white jeans. I don't have kids, but I have 4 fur-kids, and I know the struggle! I got the same dress in my last fix! I love it!!! Love this fix and the white pants are amazing. I am having a hard time buying white pants for the same reason. Seriously, those white pants. BUY THEM TODAY!!! So many cute pieces! Glad you kept the maxi- it’s adorable! I LOLd about the fashion blog bit. That dress is beautiful! I want to see the back ;) Im torn between wanting white jeans and actually being able to wear them, totally feel you. That dress looked beautiful on you! I love the jeans, too, but white around kids is a no no! 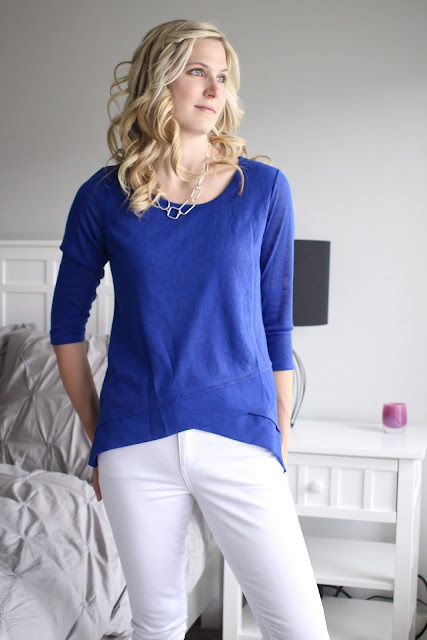 While I don’t do Stitch Fix (yet), I do love these posts. It’s so fun to see what others get and keep. That dress looks like it was made for you. You got some great pieces this fix. I have been on the fence for so long about trying Stitch Fix... I think I might have to finally give in and give it a go! I love the pieces that they sent you -- especially those white jeans. I have the same problem though - I feel like mine would be dirty the instant I put them on.